Coconut oil guide › Coconut oil blog › How much coconut oil for weight loss? As much as your body can take it. Coconut oil not only helps to stimulate metabolism for burning fat, it also helps to increase your colon motility for more frequent bowel movements. Sounds good if you have chronic constipation issue. And don't forget that detox is a critical element for losing weight. Hence, the more coconut oil you consume, the merrier. But if you take more than what your body can handle, the runs can zap you out. Which is why I cannot give you a specific quantity of coconut oil for weight loss because each person has different body constitution and if any, medical condition. 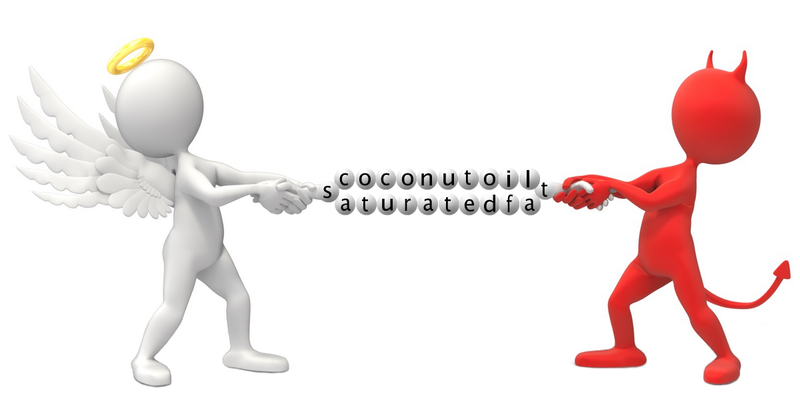 Therefore, each of us may react differently to the detox effect of coconut oil. "Okay, but at least tell us how much coconut oil we should start with." 1. How much coconut oil to start with for weight loss? Never take too much coconut oil in one sitting, especially when you're just getting started. Never ingest coconut oil on an empty stomach. Remember just now I told you coconut oil can help increase your bowel movement? If you take too much at one shot and/or on an empty stomach, coconut oil can cause symptoms similar to diarrhea such as severe stomach cramp, watery stools or nausea. Detox is good, but not to the extent of having to run to the bathroom so many times that may affect your work or sleep. I hope to help you lose weight with coconut oil without getting the "side effects". That said, you should always begin with a small amount and add coconut oil to your meals. For example, mix one teaspoon into your breakfast. And that's it for the day. Don't take too much in the beginning. Observe to make sure your body feels good with such quantity for at least 5–7 days. When everything looks okay, then increase to 2 or 3 teaspoons per day. Again, add to your meals. And stick for another week just to be on the safe side. But remember, spread out the amount. Like 2 teaspoons to breakfast and 1 teaspoon to lunch or vice versa. Will this amount effect any fat-burning yet? Not quite. Because it's only 3 teaspoons (i.e. one tablespoon) of coconut oil per day. Even if there is, your scale won't deflect too much. Eating coconut oil this way is more for helping your body to adapt to coconut oil's detox effect first. So, don't expect much fat to burn at this amount. Oh, one thing I forgot to mention. You should try to eat less coconut oil during dinner. This is to help you avoid the diarrhea symptoms (in case it does trigger) throughout the night that may affect your sleep quality. Taking coconut oil in the morning or afternoon allows you to at least have some buffer during the day for multiple bathroom visits. By the time you hit the sack at night, the effect should wear off and so you can sleep soundly. As a seasoned coconut oil eater, I take more coconut oil in the day than at night. I do pour some over my meal at dinner but probably just a teaspoon. For your case, I would suggest that you stick to morning and afternoon until you become a seasoned eater like me. As the fat deposits that come from your intake of other foods can easily out-calorie what coconut oil has burned off, you need a pretty good amount of coconut oil to effect weight loss on you. Having said that, you should also lower your consumption of other high-cal food as you increase your intake of coconut oil. Ultimately, calorie still counts when it comes to losing weight. The max for most people in general is 3 or 4 tablespoons daily. This is the same for those who eat coconut oil for health benefits. But if you can shoot up to 5 or even 6 tablespoons in a day, that would give you an even stronger and longer lasting fat-burning effect. But be prepared for more bowel movements. More bowel movements definitely help a lot in getting rid of toxic waste quickly. If you allow the waste to get stuck in your colon for days, the toxins from the waste will get resorbed back into your system. They then get stashed into your fat cells, preventing your body from utilizing the stored fats to fuel your metabolic activities. However, bear in mind not to force it upon yourself. If you max out at 3 tablespoons per day, leave it at that. You'll lose weight at a relatively slower pace, but at least you don't throw yourself to the toilet too often. In short, there are no hard and fast rules on how much coconut oil you should take for weight loss. It all depends on how fast you want the pace to be and how far you can go. But do remember that you need to first condition your body by increasing your intake of coconut oil gradually and progressively. And adjust its amount accordingly to best fit your lifestyle and the pace you feel more comfortable with. On top of that, you should also reel in exercises to step up your metabolism further for more burning of fat. Exercising can help to suppress your appetite so you don't eat too much food unnecessarily. Plus, if you employ the principle of high-intensity-interval training (alternating between high and low intensity levels) into whatever exercises you do, for example, cycling or jogging, you can speed up your fat-burning and result in greater weight loss in shorter time. 3. How much coconut oil to take after weight loss? If you ever succeed to shed off your excess pounds with coconut oil and achieve your desired shape, continue with your consumption. Don't stop. "But I'm afraid coconut oil will make me too skinny." Trust me. It won't. The amazing thing with coconut oil is that the more stored body fats you have, the more will get burned. In other words, if you have less stored body fats, of course, you'll have less to burn. What's more, it can help maintain your metabolism so that you won't easily grow back to the size you were having. So, why stop? Actually, coconut oil is primarily meant for lifting immunity due to its high content of saturated fats and antimicrobials. Saturated fats neutralize free radical reactions while antimicrobials fight off harmful pathogens. I started taking it in the first place for such reason. It just happens that it also helps to move bowels and lose weight as the "side effects". Which is why coconut oil has become a constipation relief as well as a fat-burner for many people. So, how much coconut oil should you take after a successful weight loss? Keep to the amount you have been taking. That should be fine. For example, 3 tablespoons per day. This quantity is what I recommend for obtaining health benefits from coconut oil. But if you want to cut back a little bit, by all means. Just make sure you have enough to keep your immunity in good condition and maintain your metabolism at fat-burning level. Sorry for what may be a silly q.
I can take 2 Tablespoon daily of coco oil without any issues. My query is i work in a company where we cant take liquids. Hi Ram, if you really want to take coconut oil in noon, the only way is to prepare your lunch (with coconut oil added) at home and then bring the lunch box to your workplace. But you don't carry lunch box, so the other alternative I can think of is buy coconut oil capsules so you can pop the capsules anytime you wish. But this is a really expensive option. Otherwise, you can increase your intake in the morning and evening to make up for the loss of coconut oil intake in noon. Is there a weight to amount of coconut oil ratio? I have a 13-year old daughter who is 5'4 and 165 pounds. Hi Sherrie, it's not possible to have such a ratio because weight composes of the masses of muscle tissues, skin tissues, body fats, organs, bones and water etc. If your daughter belongs to the edema type, her water mass would be relatively higher and coconut oil does not help to expel water. Even if there is such a ratio, it would not be accurate. You can try starting one teaspoon per day on her as suggested in the article above. Or if you want to speed up a little bit, try one tablespoon per day (spread over 2 meals such as 1/2 for breakfast and 1/2 for lunch) on her and see if her body gets any GI symptoms like diarrhea or stomach cramp with coconut oil. The key to effective weight loss (more to the point, fat loss) is to rev up metabolism. Coconut oil is good at increasing metabolism, and also it helps to prolong the emptying of stomach so that you'll eat lesser than you require. That said, the more coconut oil you consume, the merrier, but on the premises that your body is able to adapt well to coconut oil's "side effects". Hi Esmeralda, I can't give a specific timeline on when you'll get to see results. Based on the info you gave, your fat mass should start reducing within a week and thereafter, but how much I can't promise since I don't know how long you'll be working out at the gym even though 6 times a week. You should take as much coconut oil as you can for better performance. If your aim is solely weight loss, then try MCT oil or MCT powder. These 2 products carry only medium-chain triglycerides (MCTs) that can dramatically boost your metabolism for maximum fat loss and raise your overall performance level. But beware of their potent detox effect that could trigger diarrhea-like symptoms. That said, always take them with food and start slow until your body can fully adapt to the effect and then increase to as much as your body can take. Keep in mind that muscle is denser than fat. So the build-up of your muscles could constitute most part of your weight. Honestly, 131 lbs (not kg, right?) seems like a good fit for a regular gymmer. Don't get too obsessed with losing weight. Of course you can, Diane. You can pour coconut oil over any food because it mixes well with most food since it is an oil. You can cook with coconut oil too, just as you would do with the cooking oil in your kitch now. If you're able to substitute coconut oil for other dietary oils, you definitely will lose weight. Hi Soon! Im new to this and I just started taking 2 tblspoons of coconut oil twice daily. I am trying to stay low carb, protien and veggies, I also do 3 times a day ACV w/ cayenne/ lemon. I am extremely overweight, I weigh about 210 5'6 medium frame. Sedetary office job, I'm miserable....one of my strong points is "IM PERSISTENT" LOL. Do you think Im on the right track, any suggestions? Hi Maria, you said you're trying to stay low carb, protein and veggies, do you mean "low carb", "low protein" and "low veggies"? Please note that carbohydrate is still the main source of energy our body (especially our brain) should derive from. So, how "low" is low-carb? We should try to eat moderately low-carb but not on the extreme side that causes our body to behave erratically. Consistent bad breath, headache, nausea, constipation and giddiness are signals from your body telling that its carb intake has gone way too low. So, adjust accordingly until your body stops giving such signals. A good weight loss diet should consist of at least 40-30-30% (carb-protein-fat), or 40-20-40. Don't worry about having your carb that "high". Just take complex-carb food like instead of white rice, you eat brown rice. Take wholegrain bread instead of bread that is made from white flour etc. Veggies... try to eat more as they could make you feel full longer with their plentiful fiber so as to keep any extra calories off your plate. If you follow the 40-20-40 diet style, this 40% fat must come from good fat like coconut oil. Try to get your protein source mostly from plant as plant-based protein can provide more phytonutrients to help fix your metabolism. Animal protein carries lots of toxins that could slow the burning of fat. Since you're persistent, then do make yourself move a lot. A rapid, successful weight loss stems not solely from a proper diet, but an active body as well. Good morning Soon! Yes I have started walking....60 minutes 3-4 times a week and will be incorporating strength training here in the next few days. I did try to do Keto....but I'm not liking the hairloss. I read a few blogs on My Fitness Pal.... adjusted my BMR/TDEE to eat the appropriate amount of calories for my body. I appreciate the correct ratio.... I was doing higher fat....20 percent carbs... moderate protien. Thank you so much for responding and excited to have come across this new information..... I know I will get where I need to be. Have a great day. Hi Maria, depletion of carbohydrate over extended period of time forces your liver to make glucose from proteins and fats. This can add tremendous stress to your liver. When liver fails to function optimally, detoxification of your body is compromised. Immunity will fall as a result. That's just one of the many hidden risks of doing an improper low-carb diet. What's more, you're planning for strength training. All the more you need higher carb to sustain that. Over the years, I've heard many people doing low-carb (perhaps even lower than yours) and yes, they lost weight and got the shape they have wanted badly eventually, but they lost their health as well. They tried fixing but the damages made were permanent. They have to live with the damages for the rest of their lives. Losing health at the expense of risky weight loss diet... it's just not worth it. God designs our body as such – carb as the primary source of energy, fat as secondary, and protein the building blocks of tissues. If we go against the natural way our body should behave, it will backfire. Listen closely to your body and if this starts to display some abnormalities on your body, increase your carb intake to 40% by adding more complex-carb food. Keep this in mind. With perseverance, I know you'll get to where you want to be, but just don't get too obsessed over downsizing yourself and lose your grip on health care. Health is just as important. Your weight loss achievement would be meaningless if you do not have the health to enjoy. Agree? Hi Frieda, I don't recommend drinking coconut oil and rubbing it on stomach does not effect weight loss. Please read up on Coconut Oil for Weight Loss and follow the tips there. Hi Frieda, please read carefully. I have mentioned clearly how you can add coconut oil to your diet for weight loss in that article. Apparently, you're lazy to read them all and not paying attention. I know there is a lot of info you have to read up on. But if you're serious about losing weight with coconut oil, then be patient. Impatience will take you nowhere. Also, please observe basic courtesy when posting comment anywhere. Don't use all caps as if you're shouting at someone or giving command. That's very rude. Do you like it when people do that to you? Showing respect to others is akin to showing respect to yourself. Excellent information. I just started on a low carb diet and did not know how much coconut oil is essential in fat loss. I have only been taking 1/2 tbsp day plus some in cooking. I will increase it. Thank you again for the blog. You're welcome, Melissa. You might like to find out more about losing weight with coconut oil so that you can burn fat more effectively in shorter time.